This post is sponsored by Ronzoni. All comments and opinions are my own. There are a few meals that I could probably eat every single week of my life. 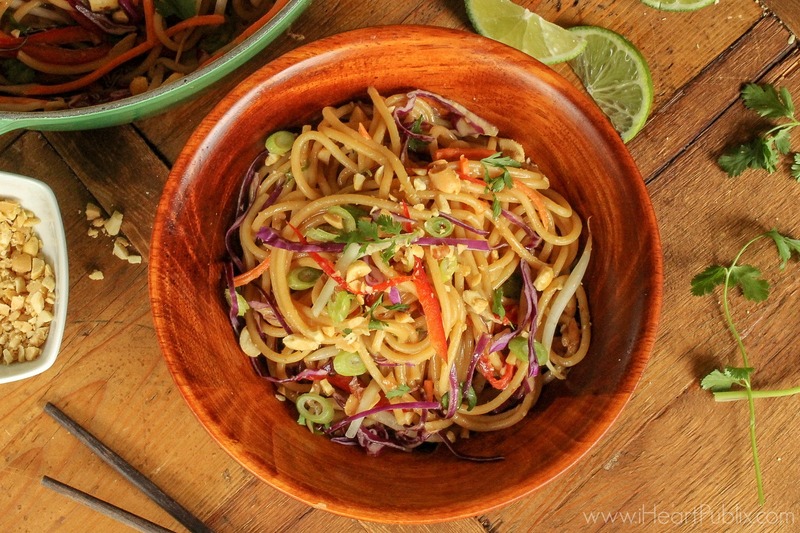 My Peanut Butter Thai Noodles is definitely one of those meals. It’s a super quick meal and very versatile. Sometimes I add leftover cooked chicken, sliced pork or even cooked ground turkey. I find it is absolutely amazing even without meat so on a busy night, I just toss together this meatless version that I am sharing today. You can also vary the veggies based on your preference. The recipe that I am sharing below is my ideal meal. I think the combination of the flavors and textures is just right. But, if you don’t like bean sprouts…just leave them out. Love cucumber…add more. Play around with the ingredients and make this one your own! One thing I wouldn’t change is the pasta. For this recipe, I prefer Ronzoni Thick and Hearty™ pasta. The peanut butter sauce is not super thick so you NEED a pasta that clings and hold as much as that amazing sauce as possible. 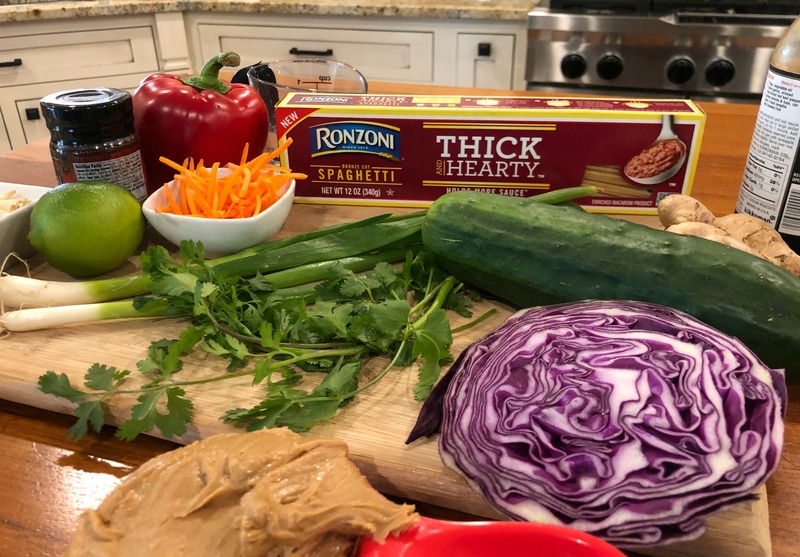 Ronzoni Thick and Hearty™ pasta is the perfect pasta for my recipe because it’s made with a bronze die. The bronze die gives the pasta texture to hold more sauce and flavor than non-bronze cut pasta. So, the sauce sticks and clings to the pasta, instead of being left behind on the plate! Right now you can save on your next purchase of Ronzoni Thick and Hearty™ pasta thanks to the Ibotta offer. Stop by Publix and grab up to FIVE boxes and redeem the high value offer to save $1 off each box! 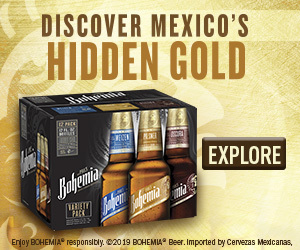 Plus, there is also a bonus offer that will help you stock your pantry at a fantastic price. 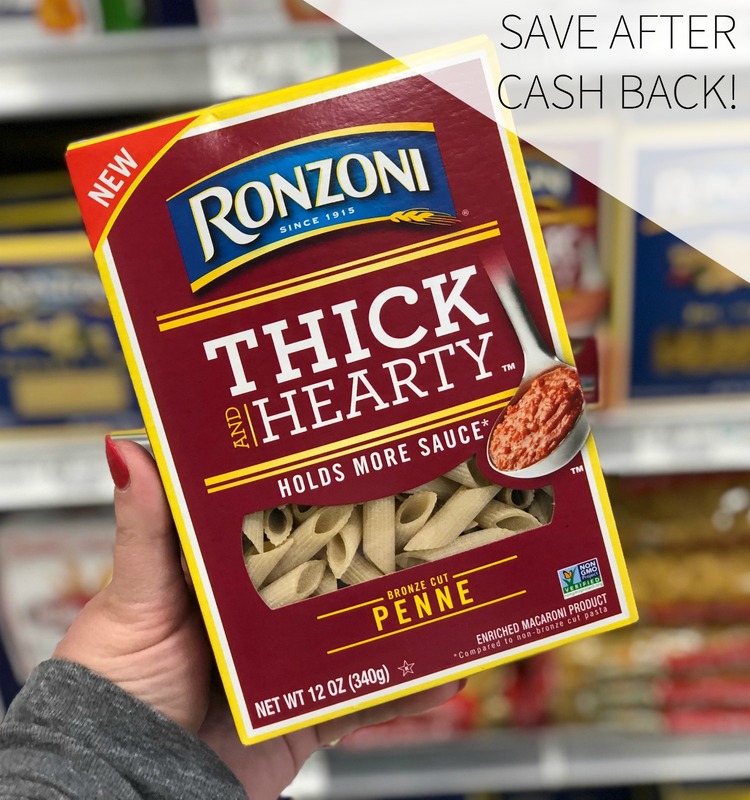 Pick up both Ronzoni Thick and Hearty Pasta and a box of Ronzoni Homestyle Pasta and you’ll pay just 35¢ per box after cash back–WOWSA! 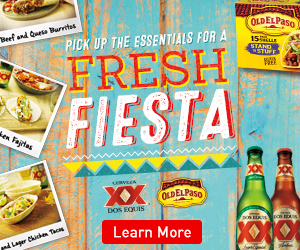 Just 59¢ per box after cash back and bonus! Head into Publix and grab a few ingredients and serve up my Peanut Butter Thai Noodles when you need a meal that is easy but still packed with delicious flavor. Save some money and enjoy a tasty meal that’s perfect for a busy weeknight. Combine ginger, peanut butter, water, soy sauce, brown sugar, lime juice, chili paste and sesame oil in a medium microwave safe bowl and mix slightly. Place bowl in microwave and cook for 45 seconds. Place bowl back in microwave and cook an additional 30 seconds. Remove and stir until combined...repeat if necessary. Combine the noodles and veggies in a large bowl and toss in the prepared sauce.